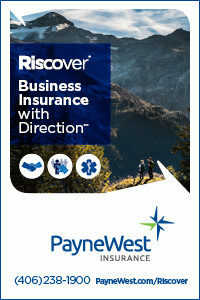 We’re proud to be a major supporter of small business, and we are proud to support our community. When you shop at local businesses, you help our community grow. Together, we strengthen our community by continuing to support the Shop Small ® initiative all year. Especially on November 24th, shop with small, local businesses. Shop Small on November 24th and join in on our game! Retailers: When customers come in November 24-27 with a game board, just mark your space and return it to them. If it’s their 10th stop, they can leave the game board with you with their contact info filled in. Our staff will swing by and pick them up. 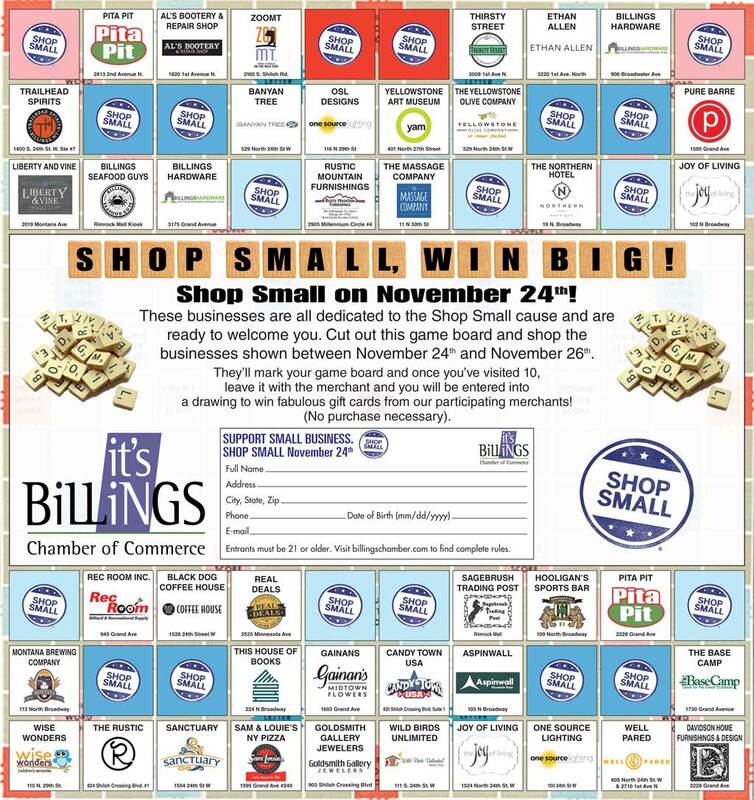 Consumers: Find it in the Billings Gazette on Thursday 11/22 or Saturday 11/24, or you can download the game board by clicking here! Once you have the game board all you have to do is SHOP! Get your board signed off at each participating merchant you visit. Once you’ve visited ten, (any ten – there’s no need to get ten in a row – just any ten!) leave your game board there to be entered to win one of the many prize baskets full of goodies from the participating member businesses! (Prizes valued up to $500 each.) Check out the official rules and regulations here..
You’re a key part in helping Billings’ small businesses thrive. By shopping or dining at small businesses, you’re showing your support for fellow member businesses in our community. The game lasts all weekend – meaning you don’t have to cram all your shopping into Saturday. Start on Saturday, November 24th and shop through November 27th. We’ll pick them up on November 28th and announce winners on November 30! Mark your calendars for Saturday, November 24th to shop and support our local businesses. 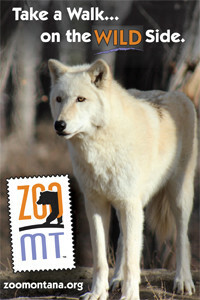 Some of our participants are offering special deals for Small Business Saturday! Learn more here. Join the conversation! Follow us on Instagram @BillingsChamber. Click here to check us out! And remember to use #BillingsShopsLocal and #BillingsEatsLocal. Thank you to our 2018 Small Business Saturday Participants! What is the Small Business Saturday Movement? Small Business Saturday was started in 2010 by American Express in hopes of building a day dedicated to shopping small businesses and offers a fun way to celebrate the holiday shopping season. For the past several years the Chamber added a fun spin to the shopping day through the Shop Small game board, allowing us the opportunity to promote our small business members and help drive sales by engaging our community. In fact, Small Business Saturday 2016 reported $15.4 billion in sales for independent retailers and restaurants on that day alone. American Express encourages area Chambers of Commerce to champion their city’s Small Business Saturday so they can link together small businesses across the city, help coordinate media and marketing, and ultimately champion the drive for consumers to get out and shop small businesses. And, now we need you to rally with us! Explore the questions and answers below to learn more about the program. Q: When is Small Business Saturday? A: Small Business Saturday is November 24th and marketing for this campaign will be promoted throughout the month of November. Q: What is the Small Business Saturday Game and how do I play? A: The Small Business Saturday Game is a way for you, the consumer, to get out, shop with small businesses, and enter to win gift cards from the participating merchants! The game actually lasts all weekend – meaning you don’t have to cram all your shopping into Saturday. Start on Saturday, November 24th and shop through November 26th. At each stop, have an employee mark your board. Once you’ve visited ten participating merchants, leave your game board there. We’ll pick them up on November 27th and draw winners by December 7th! Q: Can anyone participate in the game? A: No. Participants must be 21 years of age or older. Complete Rules and Regulations available here. Q: Do I need to purchase something at each of the ten merchants? A: No. No purchase is necessary. Complete Rules and Regulations available here. The Billings Chamber is based on small businesses; in fact, 88% of our membership base is comprised of small businesses. The Billings Chamber supports all businesses through a combination of advocacy, facilitated business connections, and opportunities for growth. In particular, our advocacy efforts aim to be a voice for small businesses in general, speaking out in favor of the legislation, policies, and movements that are pro-business, and advocating against those that will do harm to small businesses. Small Business Saturday and our Shop Billings movement are a perfect example of these efforts. Before going online this holiday season, support your friends and neighbors. Shop Billings!